Legacy Post & Beam relocates office and production headquarters to Fremont, NE. Like the look of post and beam, but not sure how it compares to a conventional (stick frame) building? Here we discuss four of the key structural differences. It’s no secret, the beauty of post and beam buildings is in large part the wood used to construct them. Today we want to give you some insight into the top reasons we choose kiln-dried Douglas fir for our bent work. As a post and beam company, we know firsthand that not everyone knows exactly what post and beam is and/or how it compares to other types of construction. And that’s ok! That’s what we’re here for. Today, we will give a brief overview of the different types of construction post and beam is most often compared to, which should also provide clarity on the construction form itself. Though we are biased to post and beam, each type of construction is great in its own way and has its own place in the market. As always, we encourage you to reach out with specific questions or for more information on any of the items mentioned below. This is the most standard form of construction today. Buildings are constructed from 2×4 or 2×6 dimensional lumber, which is an extremely easy material to access and a main reason this construction method is so common. Stick frame buildings have a long lifespan, are durable, versatile, and affordable. They differ from post and beam in that they are often reliant on interior supporting walls for strength, which can dictate floor plans. Additionally, the building materials are not visually appealing and need to be covered up with drywall. This limits the usable space on the second level and makes workarounds necessary for vaulted ceilings. From a price perspective, post and beam costs a little more than a stick frame structure, but not as much as most people think. If you are trying to make stick frame look like post and beam, it costs less to just go with post and beam from the beginning. Because the term post frame is similar to post and beam, people often get us confused. In reality though, post and beam is completely different than post frame and we fulfill much different needs in the market place. A pole barn or post frame building is a structure that uses large poles/posts buried in the ground for its support. A foundation is not required, which makes these a very low cost and attractive option for those needing a purely functional barn or storage space where longevity is not a high priority. The downside to these structures is that they carry very little aesthetic appeal and have short lifespans, often less than 50 years. This makes it hard to recoup the investment, especially if you’re looking at doing a home, cabin, or commercial facility. Additionally, to pass most city/county codes, the living and/or customer space is often only feasible on the second level. This form of construction has been around even longer than post and beam and results in beautiful wood structures. Customers considering log buildings are often drawn to post and beam because they both feature fully dimensional, exposed wood components. There are many differences between the two though. First, the price point on a log home is often much higher than post and beam. Second, log homes require more reoccurring maintenance (due in large part to the settling of the logs). Third, the support systems are much different which has a few key effects on the building we’ll briefly discuss. Log homes get their strength from an interlocking horizontal framework where the logs are notched in the corners to join together. This framework forms the walls and in many cases, stick frame trusses are put on top of the log walls. This results in the same limitations mentioned with stick frame buildings of less usable space on the second floor, and the lack of a ‘true’ vaulted ceiling. Additionally, because of the log walls, a log home is through and through a wood home, meaning you can’t pick and choose which walls you want drywall on unless you duplicate a wall. Mortise and Tenon and post and beam are both forms of timber frame construction. Both utilize fully dimensional timbers formed into bents as the support system of the building. This allows for open floor plans, truly vaulted ceilings, and beautiful exposed wood to be a part of the showcase of the facility. The biggest difference is how the timber materials are connected. Mortise and Tenon uses wood and peg joinery, which involves a hole and a tongue that fit together securely. This is the most traditional form of timber framing and is undoubtedly beautiful. However, it is expensive because of the extra work of creating these intricate joints. Both the kit cost and the on-site construction cost are increased. Post and beam uses the same concept, but uses a steel plate with bolt connection in place of the wood and peg. This simplifies the joinery, which drives down the costs of both the kit and on-site construction. Additionally, the bold look of the steel plates against solid Douglas fir timbers creates a rustic look with an industrial flair that draws many customers to it. Post and beam joins many of the benefits of each of these construction types together. It accommodates both rustic and contemporary design styles, as does stick frame construction. 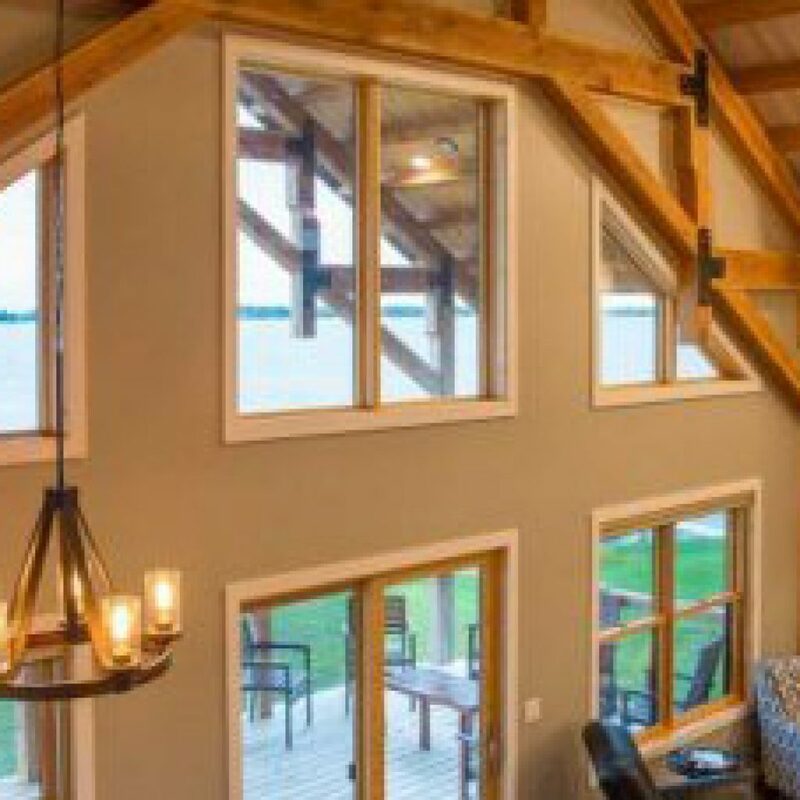 It comes at a price point between a post frame building and a timber frame or log building, making it one of the most affordable ways to attain an attractive, longstanding structure. Finally, it utilizes fully dimensional timber bents, which allows for a wood structure with truly vaulted ceilings and open floors. Have you ever made a purchase you were excited about, then a week later saw it advertised at a better price and it took some of the joy away? Or even worse, purchased something to capitalize on a deal, but then realize it wasn’t exactly what you were looking for? Well we have been there, and that’s why from the time our company was founded, we decided that a post and beam kit was too big and important of a purchase to try to lure customers in before they were ready or make them wonder if they were ‘really’ getting the best price. 1) It’s THE price we are offering. You won’t have to wonder if the next customer who calls in is being told something different, nor is waiting 24 more hours going to drastically change things. We don’t mark our kits up, just to mark them down, we offer an upfront price from the beginning. We aren’t leaving out key components only to tack them on later, after you’ve gone just far enough into the process to not be able to back out. All of our kits use the ‘gold standard’ wood choice for post and beam, Douglas Fir, and they include more base components then many other kit providers. Even with that, we are extremely cost competitive when compared to other kit providers that use lower quality materials and/or have upgrade charges to meet our base model. The cost to add something to a kit is the same cost to remove it. This may seem like a given, but we’ve found that isn’t always true. Our goal is to be an education-based post and beam kit provider that offers a high quality product at a fair price. This format ultimately allows each customer to make the decision that’s best for them and at the time that’s right for them. So, while our leadership team is the first to cash in a ½ price ice cream cone coupon, or 25% off t-shirt deal, we just didn’t feel a dream barn, home, cabin, venue or other post and beam kit purchase deserved this same type of treatment. We don’t want to be misleading and say our prices never change. They do change periodically (typically annually), but this is an all-inclusive measure that includes some component prices increasing and other decreasing. It’s NOT a sales gimmick and it’s something we give plenty of notice about. To learn more about our pricing model, or get a quote for your post and beam project, reach out to us at 402-317-5747, info@legacypostandbeam.com, or stop by and visit us in Fremont, NE! Legacy Post and Beam now located in Fremont, NE! If you’ve been in contact us with over the last few months, you’ve likely heard about your our relocation to Fremont, NE. We are excited to now share a look at our new custom-designed office and production facility with you! We officially moved in May and are now up and running at increased capacity in our new home. 1) Our entire full-time staff made the move with us! We were beyond fortunate to bring our team with us as we truly believe it is the employees that set Legacy apart in quality and customer service. 2) Our free shipping radius (500 miles) includes our previous location and now also reaches into Texas, Oklahoma, Arkansas, and more! 3) The increased production space in our facility allows us to build multiple projects at a time. This makes us an even more lean-mean-post-and-beam-kit-producing-machine. 4) The extended lean-to’s on the side of the shop allow for more covered wood storage which helps us hold a higher inventory level, keeping our turn around time low and also better caters to walk in material sales. 5) The post and beam show room on the front, which allows customers to see the beauty of our timber kits firsthand. This is phase one of the office space so stay tuned for more to come! If you’re in the area or up for a road trip, we encourage you to stop by and visit us! Our new address is: 3220 Morningside Road, Fremont, NE 68025. To learn more about Legacy Post & Beam, or to get started on a Post & Beam kit, contact us at 402-317-5747 or info@legacypostandbeam.com. We’re excited to give you an inside look into this picturesque 1.5 story post and beam gable lake home. We compiled a quick list of our favorites features. Legacy Post and Beam buildings get their strength from ‘bents’ that are built from 6 inch thick fully dimensional Douglas fir timbers. Stick frame buildings are supported by wood trusses built from 2 inch thick dimensional lumber. These are durable pieces of wood – but a large number are needed to provide the strength to support a structure. When you compare that to the post and beam bents, the load bearing capabilities of the 6 inch thick wood is significantly higher, which ultimately allows for larger spaces between the supporting sections. Not needed for strength. Customers add interior walls to meet floorplan preferences. Supporting walls are required and can dictate/limit floorplan options. Since fully dimensional timbers are used, the natural beauty can be left exposed according to owners tastes. Structural components are not appealing and must be covered up completely with drywall or other materials. As you can see in the picture below, the second story of a post and beam building has a significant amount of usable space. By simply adding floor joists and flooring materials this space can be finished from corner to corner as desired by the customer. To use the second floor in a conventional building, attic trusses are needed that close off the sides and allow only the center square to be utilized. To learn more about the differences between post and beam and stick frame buildings, post and beam construction in general, or to get started on a Legacy Post & Beam kit, contact us at 605-665-8310 or info@legacypostandbeam.com. The art of post and beam has been around for hundreds of years. Like all forms of construction, advancements have been made throughout that time that benefit current day customers. Summer is almost in full swing and the Legacy team is here to help you get the most out of your outdoor hours. Take a look at FOUR of the most popular reasons customers add a Legacy Post & Beam pavilion to their property.